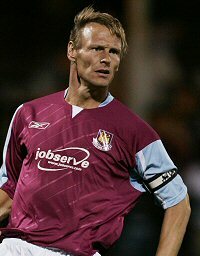 Veteran striker Teddy Sheringham has been arrested for allegedly giving false details in response to a speeding charge. The ex-England international was interviewed by police on 15 May and has been bailed until July. Sheringham’s former team-mates at West Ham Bobby Zamora and Shaun Newton have been arrested under similar circumstances and have also been given bail. The three players are rumoured to have shifted responsibility for a speeding incident between them to avoid a driving ban. Police were alerted after a civilian processor recognised one of the footballers in an image from a speed camera and noticed it was not the person accepting the penalty points. The players were arrested after an investigation into their previous speeding fines. hurry up and join forest teddy. there’s no justice to pervert in nottingham and the streets are paved with 18 year old whores.